SEVEN-YEAR-OLD PANSPACIFICFLIGHT gelding Arden’s Concord took bad luck out of the equation when he led all the way at Gloucester Park in Perth on 15 March. He hadn’t won in eight previous starts this season but punters sent him out a $1.55 favourite on the back of some luckless runs. Owned by the Butterworths, who bought him out of Graeme Anderson’s Otago stable in 2016, Arden’s Concord has now won 11 times and earned stakes of nearly $100,000. He rated 1:57.5 for the 2130 metres. Another from Panspacificflight’s stellar first crop, Last Flight In, posted her 13th win at Kilmore in Victoria on 12 March. PANSPACIFICFLIGHT mare JD Chancey’s Gal took her career earnings past $US180,000 when she won the mares open pace at Miami Valley in Ohio on 08 March. The former Indiana Sires Stakes three-year-old winner scored in 1:52.1. This was her 14th win in just 43 starts. QUALITY PANSPACIFICFLIGHT mare Reciprocity recorded her fastest time when she won a $A24,000 mares race at Tabcorp Park Melton in Victoria on 23 February. The five-year-old Group winner worked hard to get the lead from a wide draw and rated 1:54.1 for the 1720-metre journey. Her fifth win of the season, and her 12th overall, took her career earnings past $A90,000. Another Panspacificflight mare, Last Flight In (12 wins, $124,000), ran third in the same race. Reciprocity became Panspacificflight’s third Group race winner in Australasia when she won $30,000 Group Three VHRSC Metropolitan Pace Final on the same track on 04 January. Arden’s Choice won a Group I two-year-old fillies race at Auckland in 2015 and Little Rascal won a Group III mile at Menangle in 2017. THREE WINS, two seconds and two thirds from just 10 starters. That’s Brent McIntyre’s training record in the first two months of the new racing season. The Macca Lodge proprietor has won twice with the rejuvenated Panspacificflight gelding The Manipulator and with the consistent The Bull Pen, who notched his third win at Invercargill on Saturday. Brent has won 42 races with small teams since he first took a horse to the track in 1993. He has had a license to train ever since apart from two seasons — 2014-15 and 2015-16 — when Tony Stratford was the Macca Lodge trainer. Last season was Brent’s best with five wins — two with The Bull Pen, two with Hunterton and one with Captain Thunderbolt. 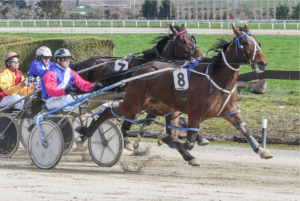 NET TEN EOM has left his first New Zealand-bred winner with the Tony Stratford-trained Wolf West scoring on his home track at Gore on 26 August. Wolf West, one of three Net Ten EOMs to qualify last season, had one two-year-old start before being put aside. He was bred by Macca Lodge client Neill Timms from his one-win Son Of Afella mare Ali’s Fella. “Timmsy” also bred the first New Zealand winner by Macca Lodge’s other sire, Panspacificflight. That was The Manipulator, who finished an unlucky third on the same card at Gore on the back of a win at his previous start. MACCA LODGE sire Net Ten EOM was represented on race day for the first time in New Zealand when two-year-old filly Countess of Arden stepped out in a Young Guns heat at Alexandra Park in Auckland on 02 March. Unfortunately, she drew the outside of the second line and suffered a check down the back straight. She had two more starts for Clevedon trainer Barry Purdon, including lining up in the Group II Delightful Lady Classic, but has now returned south for a spell. Countess of Arden, out of a daughter of New Zealand Oaks winner Young Eden, was the second Net Ten EOM to qualify here. In February Tony Stratford qualified Wolf West at Gore. Net Ten EOM, a son of the late Somebeachsomewhere, is already a proven sire of two-year-olds in the United States, where he left 18 winners from his first crop last year. ARDEN’S CONCORD raised the first 100 wins for Panspacificflight’s first New Zealand-bred crop and then quickly scored the 101st win as well. Two weeks after posting his first Australian win, the six-year-old gelding won his next start at Maryborough in Victoria on 30 November. This time connections advised stewards he would be driven less aggressively. He was taken back off the gate from his wide draw but was taken to the front mid-race by driver Greg Sugars and held on to win by half a head. He ran the 2190 metres in a 1:58.6 mile rate with the last quarter in 27.8. Arden’s Concord, previously with Otago trainer Graeme Anderson, has now won eight times from 24 starts with five seconds and two thirds.